I went into this knowing about this much about Steampunk: it’s a meld between the past and the future, giving new technologies to a time period that didn’t have them. The only steampunk I’ve read before this was Scott Westerfeld’s Leviathan series. And, even though M really really wants a steampunk costume, I really don’t have much invested in thknois fantasy sub-genre. So I didn’t really know what to expect from this collection of short stories. However, while I enjoyed many of them, I kept wondering: what is steampunk, really? Because these stories were all over the map. Some, like Kelly Link’s “Summer People”, were just straight fantasy. Others, like Ysabeau S. Wilce’s “Hand in Glove” (a mystery) or “Steam Girl,” by Dylan Horrocks or “Seven Days Beset by Demons,” by Shawn Cheng, felt more straight fiction than fantasy/steampunk at all. Does the throwing in of some mechanical somehow make a story steampunk? Even when the mechanical element doesn’t play a role in the larger story? Others, like Libba Bray’s “The Last Ride of the Glory Girls” and Cory Doctorow’s “Clockwork Fagin” and M. T. Anderson’s “The Oracle Engine,” felt more “authentically” steampunk to me, and as a result, those were my favorite stories. It could also be that I know Bray’s and Anderson’s writing (not so much with Doctorow, though I’ve met the man) and love the way that they tell stories. But, I felt that they did what I expect steampunk to do: marry technology with a pre-tech state, and give me a good story where the technology is important to the outcome. 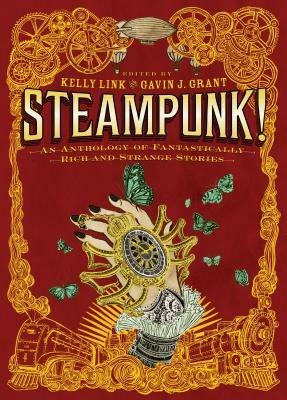 Perhaps the whole idea of this anthology was to stretch the definition of steampunk, and allow for it to encompass more genres. But I’m not sure that worked for me. Steampunk really is at its best when it limits itself to its stated definition. And when you find an author that can do that, it’s fascinating to see the outcome.